5 WAYS TO ENJOY A WONDERFUL WEEKEND IN MADRID! Inicio » Noticias Goldcar » 5 WAYS TO ENJOY A WONDERFUL WEEKEND IN MADRID! Madrid, Spain’s capital, a city full of impressive boulevards and large aml-kept parks, one good example is the Buen Retiro. Amongst other things the city is famous for its romantic and cosmopolitan ambiance as well as a wealth of European art, including works by Goya, Velázquez and other Spanish masters to be founfd in the Prado Museum. 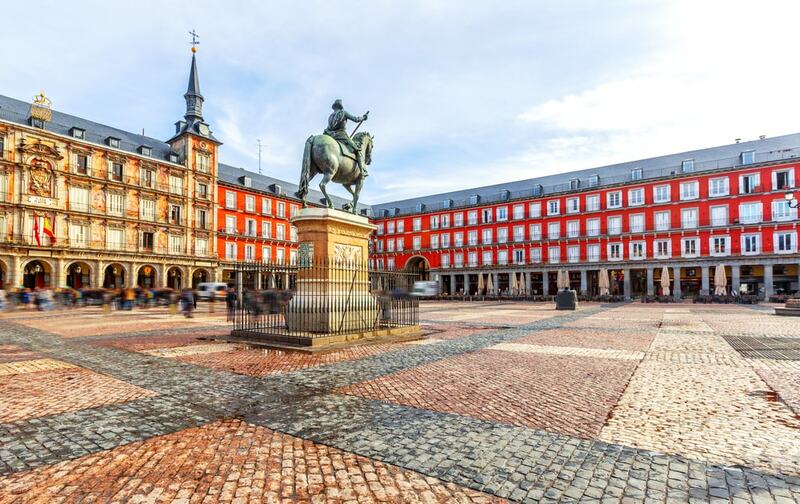 At it’s heart is Hapsburg Madrid, the beautiful portico-lined Plaza Mayor. The area, known as the Paseo del Arte boasts art and beauty like you will never have seen and all within walking distance of each other! It’s here that you find the Prado Museum, the Thyssen-Bornemisza Museum and the Reina Sofía Museum, and plenty of other places to visit too. Marking the start of the Paseo is one of Madrid’s icons. This impressive creation is located in the middle of the Plaza de Cibeles and, guarded by the wonderful edifices such as the Buenavista Palace (the Army’s Headquarters), the Linares Palace (Casa de América), the Palace of Communications (which used to be the Post Office headquarters and is these days home to the Mayor of Madrid’s) and the Bank of Spain. 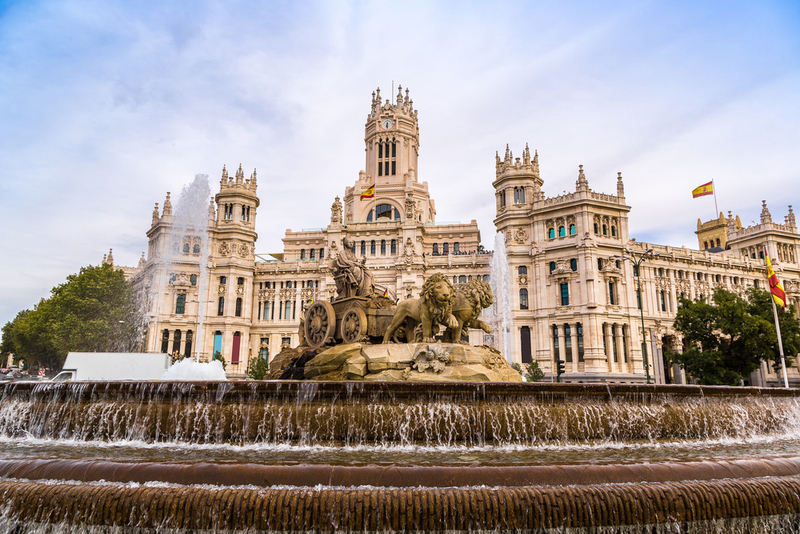 The fountain has been in its current location since 1895, has given its name to one of Madrid’s most famous squares as well as being a very well recognised symbol of the city. The Fountain depicts the Roman goddess Cibele who represents the Earth, agriculture, and fertility. Having got its name allegedly after the trail left by the carcasses of animals being between the abattoir and the tanneries that were in the area at the time. These days it is the base for over 1,000 vendors every Sundays and on public holidays too from around 9.00am. Depending on which part of the rastro you are in you will discover all sorts of treasures including crafts, clothes, toys and pretty much anything really – it’s that big! The area also boasts lots of antique and vintage furniture shops and of course plenty of places for a refreshing drink. This beautiful portico lined plaza can be found in the heart of the old city of Hapsburg Madrid, a charming area full of narrow streets, alleyways and passages dating back to medieval times. started when the king moved his court to Madrid, where the town held its market, at the end of the 15th century. It was a few years later that it gained its beauty when an architect was brought in to improve the facade – he did a great job as you’ll see! For many years the Plaza was home to many events including, bullfights, coronations and markets. Always alive a bustling with visitors and locals the Puerta del Sol is probably Madrid’s best known square and it is here you will find buskers, clowns and people just sitting (or standing) around and enjoying the sunshine while listening to the music. 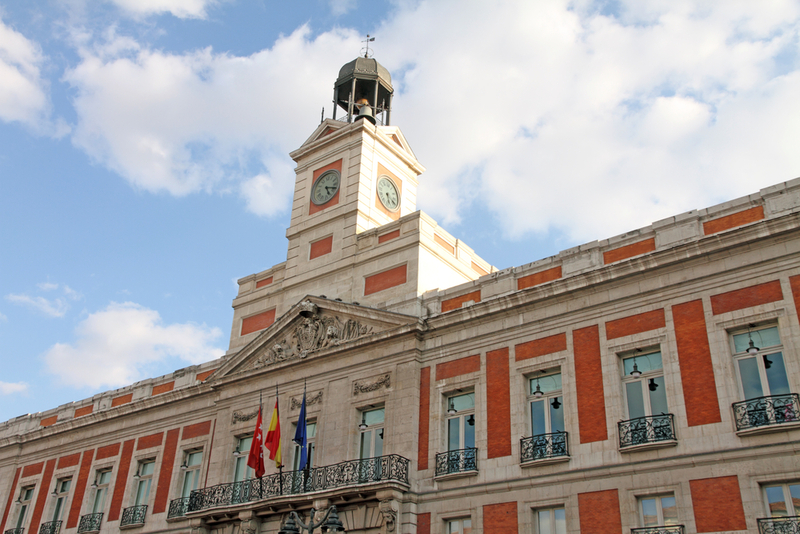 Here you will see the famous clock at Casa de Correos, Madrid’s regional government headquarters. Every year, on New Year´s Eve, thousands of revellers will get together beneath the clock and eat twelve grapes as the clock strikes midnight. However, it’s a fun place whatever time of the year you go! 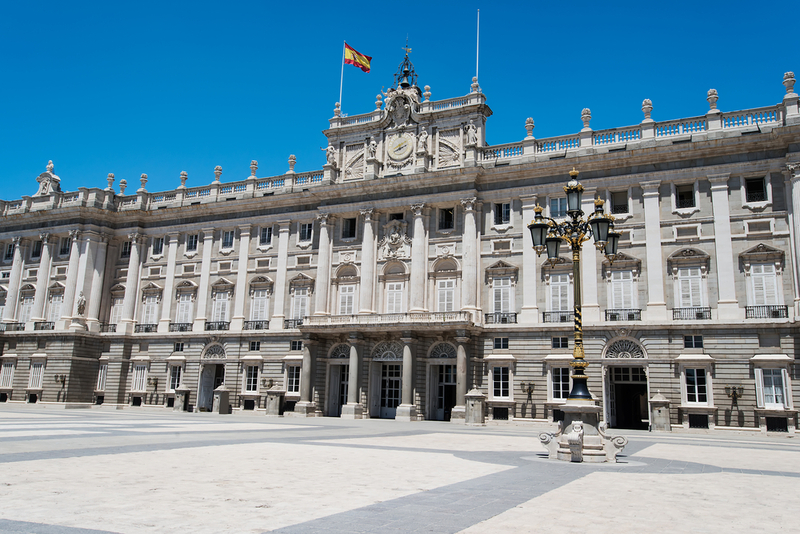 This impressive building, the largest palace in western Europe, was home to Spanish royalty such as, Charles III and Alfonso XIII, and is the official residence of the current royal family. Although originally chosen as a site for a Moorish fortress the palace finally became hoome to Spanish royalty when the Kings of Castille before becoming a forteress. Carlos 1st made the place a premanent home but in 1734 it caught fire and was destroyed- The palace you see today was built soon after that and is a wonderful exaplme of the architecture of the time. 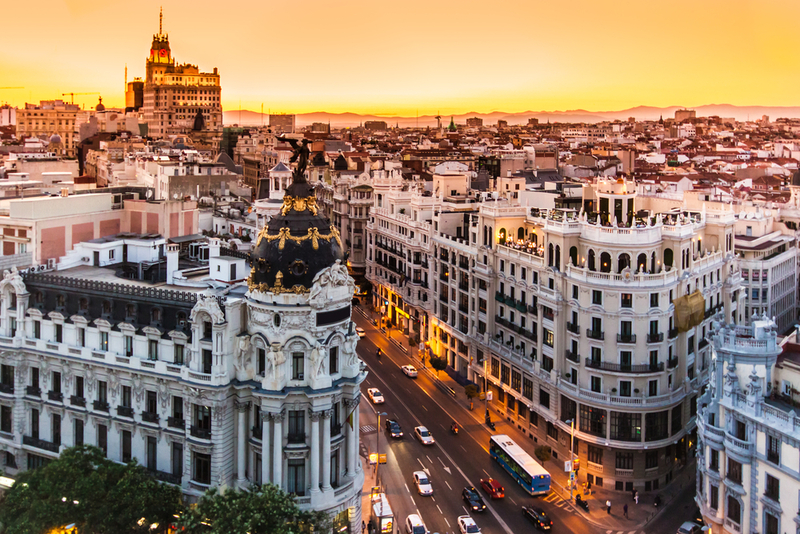 Take in history and culture in one of Europe's most famous cities: Madrid. Spain's capital, a city full of impressive boulevards and large aml-kept parks.